The Department of Medical Biochemistry is involved in many aspects of the scientific research concerning molecular mechanisms of diseases with significant public health burden (cardio-, cerebrovascular and neurodegenerative diseases, channelopathies, tumors). 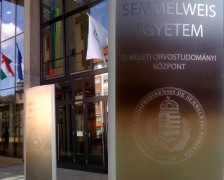 The research is funded by numerous Hungarian and international grants. Institute scientists present their data at many international conferences and over 10 peer-reviewed publications are published annually. The research work of the 15 staff members is supported by 5 PhD and 20 undergraduate students.